Freeview set-top boxes with built-in digital recorders have been around for a while from the likes of Humax and Sagem, but sales have never really taken off. Maybe that's because we've been loathe to give up on our VCRs, but the group behind Freeview think it's time for a change and have launched the Freeview Playback brand. And first off the blocks is the DVR-FP250, yours for just under £200. This model from British manufacturer TVonics is the first to find its way onto our test benches, with others expected soon from Sony, Humax, Alba, LG and Sharp. For a debut performance, at least TVonics has remembered to get the deck suitably suited and booted in the design department. Physically the DVR-FP250 looks very much like a portable hard disk you might buy for archiving files from a PC. Dressed in an aluminium gloss piano black coat, the DVR-FP250 has rounded edges and has a small enough footprint to slip into your AV set-up without too much trouble. The new branding should help us consumers equate it with other (but essentially identical) technologies, such as Sky and Virgin V Plus, but why this logo isn't called Freeview Plus is anyone's guess. Essentially it's just a another badge in an AV industry already crammed with logos, but it should help cement these TV tuner and hard disk combos in their rightful position as the 'new VCR'. It's strange that the Freeview Playback logo is nowhere to be found on our box, considering that it's the first of its type. However, we're told that the version for sale does have the logo. Saying that, the TVonics DVR-FP250 isn't a complete break from the past. The rear of the unit contains a Scart output for connection to - yes, you've guessed it - a VCR. Archiving is never going to go away and the capacity of the DVR-FP250's hard disk is not large enough to eliminate decisions about what to keep and what to delete. The DVR-FP250 gives access to all Freeview channels. Equipped with an eight-day EPG, you can look at scheduling for over 40 channels including ITV2, E4, Film4, CBeebies and BBC Three, and around twenty digital radio stations. The £190 price tag will put a lot of us off, but at least it's a one-off payment, unlike the Sky system, which costs around £10 a month just for privilege of making recordings - and before you even think about subscription channels. The one-touch recording works in much the same way as the satellite broadcaster's box. If anything, it's a better experience. Accessed by one button, the library of recordings is simply presented, but without thumbnails. Able to stretch to 125hrs, recordings are adjusted if programmes overrun and can be permanently protected from accidental deletion, or automatically deleted after being viewed. It's even possible to set the box to periodically delete old recordings, although it's not allowed to adjust the quality of recordings so as to stretch the box's capacity. Meanwhile, all material can be archived to a VCD or DVD recorder simply by setting up a playlist of recorded programmes. The DVR-FP250 promises one touch recording from an on-screen guide, pause and rewind live TV functionality that can stretch to two hours, and a 'chasing playback' option - meaning you can watch something from the start that's still being recorded. It's an advanced deck, but connectivity is basic. An old-fashioned Scart takes pictures and sound from the DVR-FP250 to any TV. At least it's RGB, and we're happy to find the provision of an optical audio out for routing sound to a home cinema amp. 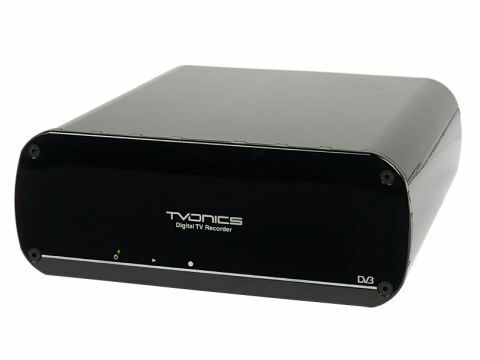 TVonics claims that the DVR-FP250 uses just 3.5W in standby mode, a third of the industry average, and that it uses 14.5W during operation. The green and yellow graphics of the menu system float over a shaded-out version of the current channel you're watching - better than a Sky box so far. But it doesn't half drag. Toggling around the electronic programme guide using the joypad-style buttons is a slow process with an annoying lag between transmitting a command and the box catching up. It reminds us of the last generation of NTL set-top boxes. But while the menus are frustrating, the rest of the system is almost a breeze. Although buttons are a touch too small, the remote is logically laid-out, gives easy access to pausing live TV and has a useful 'help' button if you get stuck. Delving into the menus, it's possible to alter the 'buffer' for pausing and rewinding live TV from 10mins to 2hrs, while the initial tuning-in of all stations takes a few minutes and manages to find every channel we expected. The DVR-FP250 holds the digital signal well. Another nice touch is the division between digital TV and the DAB radio stations. It's possible to set recordings for either. Selecting programmes to record is indeed a one-touch process, and if you select a programme that clashes with a previously-selected time slot, the DVR-FP250 gives you a choice of which one to cancel. Meanwhile, the universal remote control works by entering a four-digit code provided by TVonics either in its user guide or online. Most mainstream TVs are catered for. The sound itself is fed through the Scart and the simple stereo is good. Less so the picture, which is imbued with picture noise inherent to Freeview. But we won't blame the DVR-FP250 for that - it does as reasonable a job as any other Freeview box. With millions of VCRs needing replacing before the switch-off of analogue TV transmissions in the UK from now until 2012 (and half a million soon-to-be-defunct sold as recently as last Christmas), Freeview Playback has the whole market before it. For anyone saddled with a £30 Freeview box and a VCR (or even a DVD recorder) TVonics' debut deck is almost the perfect upgrade. With its decent operating system and plenty of easy to use features, the TVonics DVR-FP250 is as idiot-proof as it is impressive. Our only real issue is the slowness of the EPG, and the lack of any built-in HD upscaler. We expect to see better decks from bigger brands, but this is a decent start to achieving Freeview Playback's goal of tempting 10 million customers by 2012.